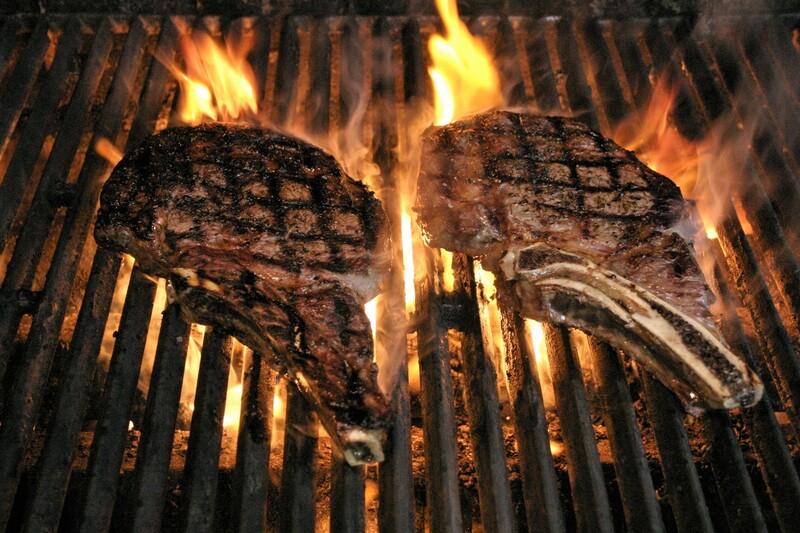 A bone-in Rib Steak is without a doubt the King of Grilling Steaks and if you select the right one, you can grill the perfect steak every time, guaranteed! 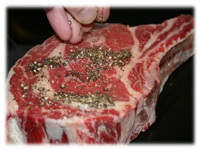 When shopping for the best steak ask your butcher for cuts at least 1" thick and look for meat with a lot of marbling or thin ribbons of fatty streaks throughout. It's those fatty streaks that really adds the flavor to the meat and helps keep it juicy while grilling. A grilling steak like the Rib with the bone-in also helps keep the meat juicy and flavorful and less prone to drying out like other cuts like strip loin. 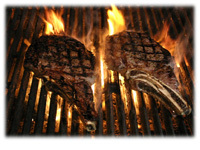 These steaks should be cooked rare or medium-rare over high direct heat, 600F - 625F. If you follow the "2-minute" rule described below then you'll have a perfect medium-rare steak in just 8 minutes. Make this meal complete with this Garlic infused Baked Potato and these easy grilled Lobster Tails. The Rib is the easiest grilling steak to prepare. No marinating required for these big boys, just rub with a little oil, black pepper and some kosher salt and you're ready to grill. Cover and let sit at room temperature an hour before grilling. 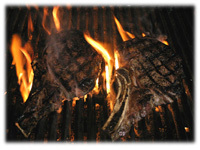 While you're waiting, prepare the grill for Direct Heat and fire it up so it reaches maximum temperature. 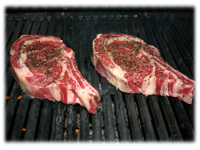 When grilling these steaks and you're looking for that distintive checkered grill pattern wait until the BBQ is at it's highest heat, 600F or higher and then place the steak in Position 1 (10:00 - 4:00) shown at right and close the lid. If your steak is 1" thick then wait 2 minutes, lift the lid and rotate (don't flip!) the meat just 45 degrees to Position 2 (2:00 - 8:00) shown at right. Close the lid and wait another 2 minutes. 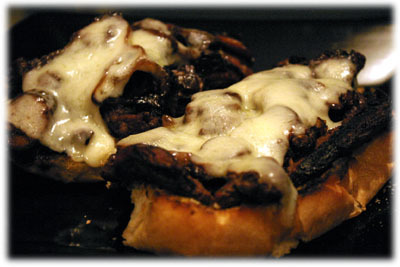 After 2 minutes it's time to flip the meat to Position 3 (10:00 - 4:00) shown at right and close the lid. After 2 minutes it's time to rotate the steak to it's last position, Position 4 (2:00 - 8:00) and close the lid. After the final 2 minutes it's time to remove the steaks from the grill. If you're unsure if the meat is medium-rare then inserting an instant read thermometer should show 120F - 125F. The internal temperature will rise at least 5F when resting. 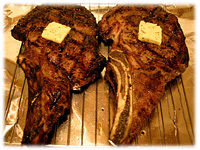 Place the steaks on a cooling rack on a cookie sheet. Place a teaspoon or pat of butter or flavored butter on the steak. 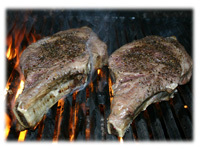 Cover the steaks with tented aluminum foil that has a small hole in the top to allow steam to escape. 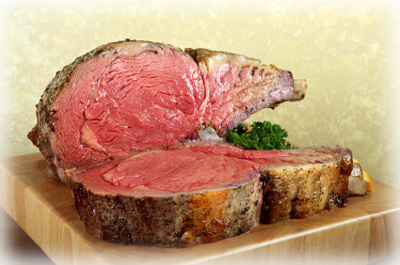 Let rest 5 - 10 minutes at room temperature before serving to allow the juices to redistribute throughout the meat.